Wondering if you are affected by Honda CRV recalls? For owners of these popular Japanese sport utility vehicles, it's a good idea to stay informed about potential safety issues. In fact, no matter what kind of car you own, you should know how to handle a recall. Since Honda began manufacturing the CRV in 1996, it has been a popular car with American consumers. 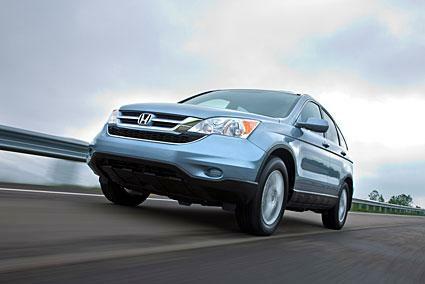 Noted for its reliability and practicality, the CRV has seen impressive sales in recent years. In 2009, a difficult year for many automakers, American car buyers purchased 191,214 of these small sport utility vehicles. In 2009 and 2010, Toyota recalled nearly nine million vehicles worldwide, leading to increased consumer concern about the safety and reliability of Japanese vehicles. General Motors, Chrysler, and Ford also issued recalls during this period of time, but a great deal of consumer and media attention remained focused on recalls by Japanese automakers, including Honda. Many CRV owners report that the small SUV is safe and reliable, but there have been reports of Honda CRV problems. If you own a CRV, you may want to confirm that your vehicle has not been recalled. In 1999, problems with the under-dash wiring harness prompted Honda to recall over 100,000 vehicles. The 1998 and 1999 model year CRVs were affected by this Honda recall event. In 2001, Honda issued a recall for problems with the seat belt pretensions on the 2002 Honda CRV. Almost 7,000 vehicles were affected. In 2002, Honda recalled 1,000,000 vehicles, including 1997 through 1999 model year CRVs. Affected cars and trucks had problems with the ignition switch, which could lead to unexpected stalling of the vehicle. In 2003, Honda issued a recall for 2002 CRVs. Almost 77,000 vehicles had problems with the ignition system. The same year, Honda recalled nearly 250,000 vehicles for a malfunction in the automatic transmission. This recall affected the 2002 and 2003 CRV. In 2004, more than 130,000 vehicles were recalled for a problem with the wiring of the driver's side airbag. The 2002, 2003, and 2004 model years of the CRV were affected by this Honda air bag recall. Later in 2004, another airbag recall was issued for 2005 model year CRVs. In 2006, Honda issued a recall of the 2006 model year CRV. This recall involved a revision to the owner's manual for the vehicle. While there are many Internet sites that offer information about CRV recalls, you should use an official source to determine whether your vehicle is actually affected. New recalls are issued from time to time, so it's important to make sure your information is up-to-date and accurate. The National Highway Traffic Safety Administration's Office of Defects Investigation provides a searchable database of automotive recalls. You'll need your car's year, make, and model to search. The automobile manufacturer can also tell you whether your car is affected. Honda owners can call 1-800-999-1009 to speak to someone in Honda Automobile Customer Service. It's important to take automobile recalls very seriously. Even seemingly minor issues could have a major affect on your vehicle's safety. Periodically checking for recalls is part of being a safe driver and a responsible automobile owner.